Astronomers discover a black hole a mass equal to 17 billion Suns in the middle of galaxy NGC 1277. The black hole is 11 times wider than the orbit of Neptune to the Sun. This may be the most massive black hole ever discovered and may be the first of a class of Galaxy-Black Hole systems. A black hole is a region in space where gravity is so strong even light falls into it. Nothing escapes the pull of a black hole. These are formed when a star, in its dying days, explodes into a supernova and starts to collapse into itself. What prevents a black hole from eating up everything around it is its event horizon. The Event Horizon is the edge or boundary surrounding the black hole which marks the area where escape from a black hole is impossible. The size of a black hole may vary from some having a mass equivalent to 20 times that of the Sun to large ones reaching up to a Sun-mass of a million times. These are called supermassive black holes. Each galaxy has a super-massive black hole in its center. Black holes are impossible to see directly with a telescope since it does not register light. These are indirectly observed by instruments that studying energy levels of stars and matter that is orbiting a black hole. The Milky Way galaxy contains a supermassive black hole equal to 4 million times the mass of the Sun called Sagittarius A.
Astronomers have used the Hobby-Eberly Telescope at The University of Texas at Austin's McDonald Observatory to measure the mass of what may be the most massive black hole yet — 17 billion Suns — in galaxy NGC 1277. The unusual black hole makes up 14 percent of its galaxy's mass, rather than the usual 0.1 percent. This galaxy and several more in the same study could change theories of how black holes and galaxies form and evolve. The work will appear in the journal Nature on Nov. 29. GC 1277 lies 220 million light-years away in the constellation Perseus. The galaxy is only ten percent the size and mass of our own Milky Way. 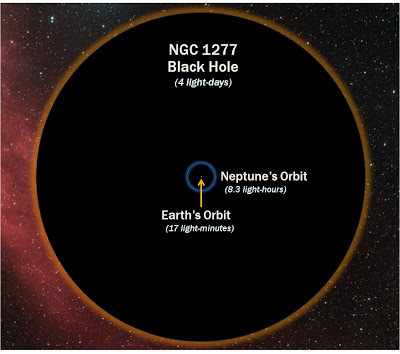 Despite NGC 1277's diminutive size, the black hole its heart is more than 11 times as wide as Neptune's orbit around the Sun. Image of lenticular galaxy NGC 1277 taken with Hubble Space Telescope. This small, flattened galaxy contains one of the most massive central black holes ever found. At 17 billion solar masses, the black hole weighs an extraordinary 14 percent of the total galaxy mass. In the current paper, the team zeroes in on the top six most massive galaxies. They found that one of those, NGC 1277, had already been photographed by Hubble Space Telescope. This provided measurements of the galaxy's brightness at different distances from its center. When combined with HET data and various models run via supercomputer, the result was a mass for the black hole of 17 billion Suns (give or take 3 billion).